Front of Postcard written by James A. Matthews · Technohistory! This is a postcard written by James A. Matthews, who served in France in 1917 during World War I. 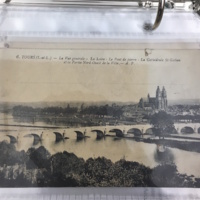 On one side, the postcard shows a scenic view of the river Loire and Tours Cathedral. On the back side, the post card contains a message from Matthews seemingly addressed to a sergeant in the military. A black and white postcard that prominently displays the Loire River, and contains a message written in pencil on the back. 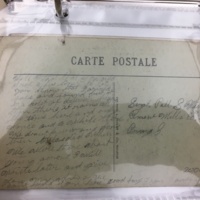 James A. Matthews, “Front of Postcard written by James A. Matthews ,” Technohistory!, accessed April 24, 2019, http://technohistory2017.lmu.build/items/show/121.